Low Carb Chicken, Cheddar and Chives Meatballs embody those three ingredients that are a perfect marriage in the culinary world. Chicken, Cheddar and Chives are a delicious addition to any Keto Diet. There’s no greater meatball than one oozing with the sharpness of cheddar cheese. These meatballs are a great snack, canape, tossed in a salad, or just served hot. Ground meats are a great source of protein and fat, and we love adding all kind of cheeses to our meatballs and burgers. Our Low Carb Lamb and Halloumi Burgers are just delicious! Our recipe makes 6 serves and the nutritional information below reflects one serving. Mix all ingredients in a bowl, until fully combined. Scoop out tablespoon sized chunks and roll into balls. Place the meatballs onto a baking tray. Bake the meatballs for 15 minutes until they are brown and feel firm to touch. 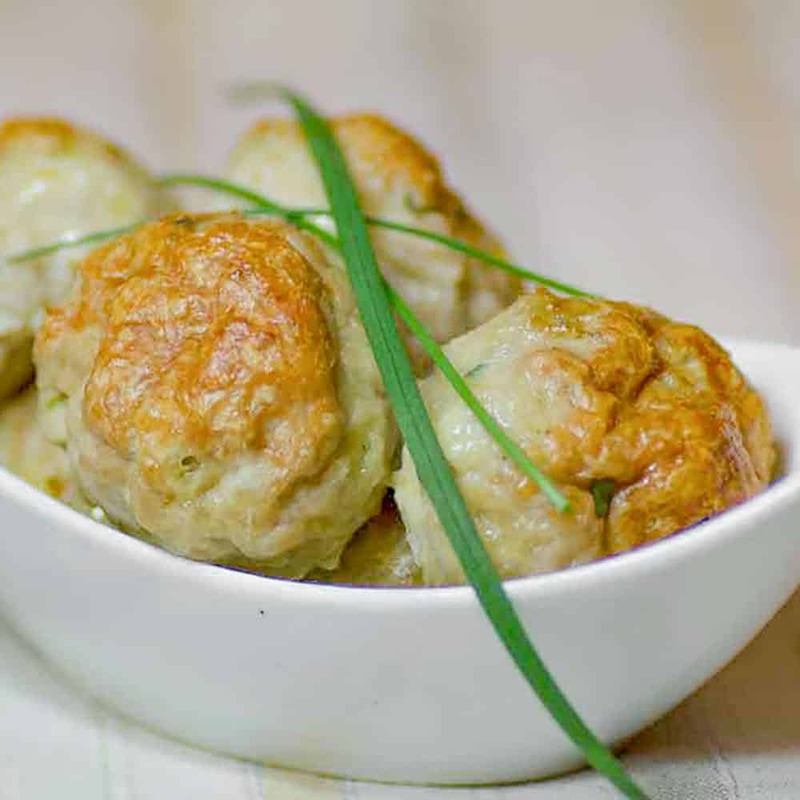 Eat your Low Carb Chicken, Cheddar and Chive Meatballs as they are, or dipped in your favorite low carb sauce. When making keto chicken meatballs ahead of time keep them well cooled in the refrigerator. 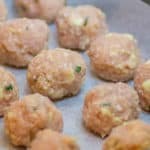 Low Carb Chicken, Cheddar and Chives Meatballs embody those three ingredients that are a perfect marriage in the culinary world. Chicken, Cheddar and Chives are a delicious edition to any Keto Diet. There's no greater meatball than one oozing with the sharpness of cheddar cheese. These meatballs are a great snack, canape, tossed in a salad, or just served hot. To make a larger batch of Low Carb Chicken, Cheddar, and Chives Meatballs, simply adjust the serving amounts in our easy to use recipe card above. Depending on the size of your meatballs you should end up with around 25-30 balls.